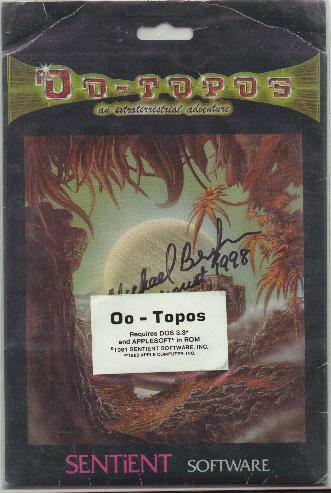 Oo-Topos (or "Oops-Toops", as Michael Berlyn himself affectionately calls it) was originally published by the small, obscure Sentient Software as an all-text, two-word parser adventure before being picked up by PolarWare in mid-1980s and converted to graphical. This version didn't have a box, just a thin cardboard folder with instructions printed on the inside. Sentient's Cyborg is the same way. I came across this on an Apple II newsgroup by pure luck, back in my college days, and it's one of the first non-Infocom games I bought for my collection (back before I even realized I was in fact collecting). It cost me a grand total of five dollars. And yes, it has been signed by Berlyn (by pure coincidence, on my birthday).